WARNING: these chocolates are almost certainly delicious and addicting. Truffini chocolate truffles uniquely reflect their European background yet are made close to home in Delta, B.C. Canada. They are a premium chocolate that uses only the freshest and natural ingredients available. Their chocolates are known for their smooth and creamy taste and their high quality. With a wide variety of flavours, it would be hard to believe that someone wouldn't find one that they would fall in love with! They come in six different flavours: Double Dark, Almond Berry, Ultimate PB & J, Orange Splash, Chic Cheesecake, and Hazel Love. 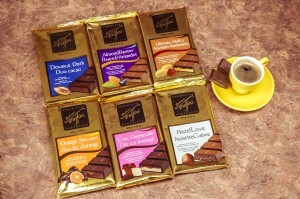 All of the chocolates are as good as they sound: delectably amazing. Peanut Butter A smooth and buttery peanut centre surrounded by an extra rich and creamy milk chocolate. Double Dark Dark & rich; a connoisseur’s delight. Made with a silky dark chocolate center and dark shell. Orange Splash Experience a burst of fresh orange in a fine white chocolate shell topped with creamy milk chocolate. Almond Berry Fruity blueberry and creamy almond butter in milk chocolate. Chic Cheesecake A strawberry layered cheesecake dessert that'll make you believe you're in heaven. Hazel Love Fall in love with a classic creamy hazelnut in milk chocolate.